Hydrologic and thermal regimes vary along the upstream-to-downstream river continuum and drive the assembly of fish communities. The metabolic cold adaptation (MCA) hypothesis predicts that faster development is adaptive for species exposed to shorter growing seasons. Whether gradients of hydrologic variability and seasonal thermal regime associated with the river continuum operate as environmental filters on species with differing developmental rates remains an untested mechanism of community assembly. We analyzed daily records of stream discharge and modeled stream temperatures to quantify these two gradients of abiotic harshness in Kansas, USA. We then used laboratory experiments to compare temperature-dependent larval development rates among three congeneric cyprinid species that are most abundant in small tributaries (Pimephales promelas), medium tributaries (P. notatus), or river mainstems (P. vigilax). Growing season duration increased with stream size, with temperature exceedance thresholds of 22 and 26 °C lasting 1.4 and 270 times longer, respectively, in eighth order river mainstems compared to second order tributaries. The frequency of small flood pulses within the growing season peaked in mid-order streams, whereas the frequency of large flood pulses within the growing season peaked in low-order streams. Larval development rates increased with incubation temperature, but did not differ predictably among species. These findings, when viewed alongside a companion study, suggest that thermal adaptation and not MCA explains the replacements of Pimephales species along the river continuum. The prominent upstream-to-downstream gradient in growing season duration highlights the need for studies on the evolutionary and ecological significance of this infrequently explored characteristic of the river continuum. The online version of this article (doi: 10.1007/s10641-017-0577-2) contains supplementary material, which is available to authorized users. The authors thank Nate Cathcart, Michael Denk, Sky Hedden, Emily Johnson, Kevin Kirkbride, Josh Perkin, Dustin Shaw, Trevor Starks, Allison Veach, James Whitney, and Rebecca Zheng for field and laboratory assistance. Many private land owners for provided access to streams as well as the Tallgrass Prairie National Preserve, Kansas Department of Wildlife Parks and Tourism, and Joe and Alison Gerken for substantial stream access. 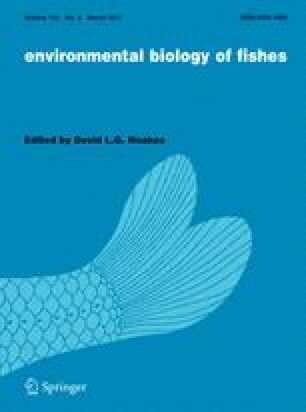 The authors thank Jake Schaefer for advice on experimental design and data analysis as well as John Blair and Conservation Fisheries, Inc. for use of equipment and laboratory facilities. This research was funded by the National Science Foundation (DEB#1311183), the Southwestern Association of Naturalists, Prairie Biotic Research Inc., and the Kansas Academy of Science. Brood stocks were collected under the permission of the Kansas Department of Wildlife Parks and Tourism (permit #SC-089-2014) and housed and spawned under the permission of the Kansas State University Institutional Animal Care and Use Committee (permit #2996). This is publication #17-208-J from the Kansas Agricultural Experiment Station. The authors have no conflicts of interest to declare.